If you've ever wanted to go off-grid and spend some time recharging from the hustle and bustle of daily life, Shacky is the ideal weekend getaway. So, what is Shacky? I hear you think... well, basically it’s a tiny house with all the comforts of home but none of the stress. Designed for a truly unique getaway experience, Shacky helps you discover the hidden gems of Australia. The exact location is kept a secret and only revealed a few days prior to your stay. The tiny homes are hosted by working farms which means you are fully immersed in the landscape and wildlife of the area. There are several locations where you can enjoy this Shacky experience, a cattle farm in the Yarra Valley; a agroforestry, honey and cropping farm in Moorabool; A 100 acre bush block in the Grampians; or a gorgeous property in Gippsland. We choose to stay on a working olive groove in Creightons Creek. As promised several days prior to our stay the exact location was provided to us in our personalised guest guide, which included directions and maps of how to get there. It also included details of what to bring and what we could expect to see while there. 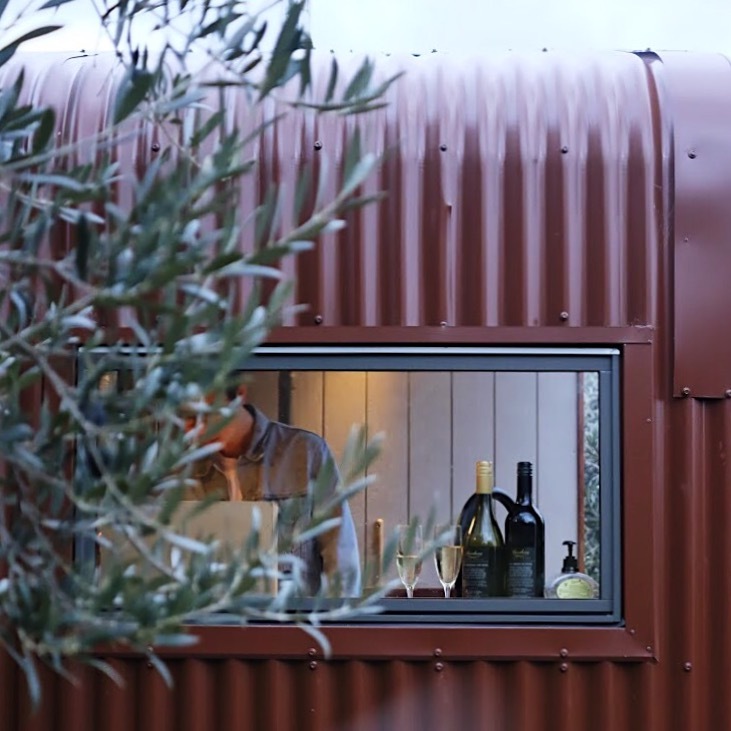 This amazing tiny house literally comes with everything you'll need for your stay. If you’re not sure what food to bring, you can even let your amazing hosts take care of that for you too. We were provided with several food options for dinner and breakfast, as well as a tasting basket with products from the local market and more importantly, wine to match. The shacky concept is all about downsizing, getting back to nature and living simply. It's the perfect way to help appreciate the important things in life. Lawson and my Birthdays are literally one days apart. When we first started dating, I wasn't sure how to feel about this given, I've already had to share my Birthday with my twin sister and now I have to share it with my boyfriend too. I quickly discovered it’s actually amazing because it means we generally plan bigger and more exciting things which we both get to enjoy and celebrate together. In the past, we've planned big nights out and because Lawson's birthday is first, it generally means we are both hungover for mine. This year to prevent that from happening we decided on a little weekend vacation instead. Shacky, is a new spin on Glamping, except a million times better. Instead of just a luxury tent, you get a whole house complete with kitchen and bathroom. It was hosted by a working olive farm and was so cleverly hidden among the olive trees we felt like we were the only ones around for miles. Lawson of course took advantage of this feeling when it got dark. He decided to scare the crap out of me by convincing me any sounds off in the distance were wild animals or a creepy axe murderer. We unintentionally fell into our gender roles. While Lawson was being very manly by lovingly creating an epic roaring fire, I found myself preparing the amazing spread that had been provided by our hosts. A highlight was enjoying the olives from the very groove we were temporarily calling home. The limited phone reception meant that we actually had to rely on our amazing conversation skills and got to spend some real quality time just being together. We drank wine, laughed by the fire well into the night. Despite intentionally trying to avoid it, we both still managed to wake up with a slight hangover for my Birthday. Totally worth it though! I find it’s always a good recharge of the batteries to get out of the city and away from all technology. Seeing as though Cat and I have birthdays back to back we always tend to find something unique to do together to celebrate. This year was no different, we went to Shacky. I had heard about the tiny house movement and have been keen to give it a go myself. We were greeted by our host who gave us the lay of the land, then left us to our own devices, or lack thereof. Being so far out none of our devices worked, so no reception. It was refreshing to have no cares in the world and spend a little time out in nature exploring the Olive Grove and really just connecting with each other without the distraction of our phones. The highlight for me was definitely building and maintaining the fire. Bear Grylls was right when he said fire was important to survival not just for warmth and to cook but for moral and entertainment as well. There is something about sitting in silence and just staring at the fire, it’s natures television. When I was a kid my Dad used to let me and my brothers build fires down the back of the garden in a fire pit, one day it was too windy so we had the genius idea to bring it up beside the house to be protected from the wind. Dad, who was keeping a keen eye on us, spotted us and put a stop to building any fires ever again. We lost our privileges. So now whenever I get an opportunity to build a fire I make sure I build a fire. I was proud of the one I made at shacky. It was so well built that even in the morning it was still slowly burning away. We had local produce and local wine that we cooked on an awesome little pot belly stove, which is basically an oven with a fire built in it. Two fires in one night, what a treat! I really appreciated building my own fire and then cooking my own meat, although not something I’d want to do it every night because it can be a little time consuming. Shacky is the perfect romantic getaway for couples to spend some quality time together in a beautiful location. We went in the middle of winter and combined with the fire and the indoor methylated spirits heater we were more than warm enough. Quick honourable mention to the outdoor toilet, no walls, just you and nature on a proper throne above a drop hole that uses saw dust and a special spray to break down and remove all smell. What away to sort out your business, unless of course it’s 2 in the morning pitch black and freezing cold.